At the Grand Lodge Communication of 1850, Roanoke County, as the result of a committee report on the rearrangement of Masonic Districts in the State, was placed in District No. 21. Taylor Lodge was the only lodge in Roanoke County. Meetings of the Lodge were first held in Big Lick on the second Thursday of each month but there is no information as to the location of the Lodge room. In the early 1850’s the Lodge moved to Salem where it has since remained. The Lodge room was located on the second floor of the Chapman Hotel on Main Street. The next meeting place was in a Town Hall near the corner of Clay Street and College Avenue. The Hall was burned during the War between the States and all the records and property of Taylor Lodge were lost. When a new Town Hall was built a few years later (possibly during 1871) the Lodge resumed meeting there. It is not known where meetings were held prior to being in this new location. Since 1882, the business of this Lodge has continued unabated despite the lapse of time and the ravages of several wars. Little is known of the furnishings of the Lodge. The three Throne, or Council Chairs in the East are probably our oldest pieces of furniture. The Corinthian Columns, Jachin and Boaz, were first mentioned at the meeting of October 2, 1883 as having been designed by Worshipful Brother R.W. Page. On May 28, 1909, Taylor Lodge No. 23 laid the corner stone for the Roanoke County Court House on Main Street in Salem. Other corner stone layings were to continue including the Williamson Road Methodist Church and Andrew Lewis High School. In 1928, approximately $9000.00 was raised as part of a pledge to construct a new Lodge building but the financial depression caused abandonment of the project and the monies collected were returned to the many donors. In 1932 the Lodge was represented by its Worshipful Master, Brother Frank H. Vest, at the dedication of the George Washington National Masonic Memorial in Alexandria. The hectic experience of the stressful years of World War II had a profound influence on the activities of the brotherhood. In 1942, all three of the stationed officers (W. Ben Chapman, H. Shank, and R. Frier) were in the armed services. As a result, the Junior Warden resigned and a Past Master was elected to serve as Junior Warden. On February 12, 1948, Charles Edward Webber, Worshipful Master of Taylor Lodge No. 23 in 1926, was elected Grand Master of Masons in Virginia. 34 members of Taylor Lodge attended this significant event in the life of this exemplary man and Mason. On February 10, 1954, Brother James I. Moyer, presented a portrait of Most Worshipful Master Webber at the Grand Lodge Meeting in Richmond. During 1966, Taylor Lodge changed its location to a new Lodge hall on Texas Street in Salem. It took several years of planning, but the Lodge was finally ready for use in the fall of that year. The cornerstone was laid by Most Worshipful C.E. Webber, Past Grand Master, on January 8, 1966. The new Lodge meant members had committed themselves to several years of donations and hard work in paying off the mortgage. This problem was eliminated in 1972 when at the Stated Communication on the 27th of December it was announced that Brother Marvin Cawley would present the Lodge with nearly $45,000. This was more than enough to pay off the mortgage on the building. Outstanding brethern have been recognized for outstanding service and dedication to the fraternity. On December 7, 1987, a brick marquee was completed in honor of Rt. Wor. Buford Dennis Butts. This signage which rests on property in front of our Lodge is constructed with 33 brick courses representing the 33 degrees obtained by Rt. Wor. Butts. Roy Howard Downey night was held on August 1, 1988 to commemorate the untiring efforts of this Masonic teacher. William Sidney Brent was so honored on November 6, 1989 and Wor. Robert Stone Wolfenbarger on August 7, 1995. 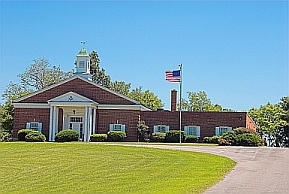 Brother Robert G. Phelgar, who completed his earthly journey on April 24, 1995, bequeathed 15 % of his estate to Taylor Lodge to be used for improvements and maintenance of the present building and grounds. More than $50,000 was placed in a special account and has been used as needed for upkeep of the Lodge and property as requested. A Commemorative Dinner was held in the social hall of Taylor Masonic Lodge on January 8, 2000 in celebration of the 150th year of our charter. Wor. Kenneth Tolbert welcomed the brethern and family members, Wor. Douglas Graham gave the invocation and Rt. Wor. Edward Kidd presented a fine review of the history of our Lodge. Coins were printed to mark this anniversary and were made available to all members of the Lodge. A plaque from the Grand Lodge was presented to the Worshipful Master by DDGM Harry Fortune honoring our charter (Dec. 11,1849).